Glottic web, inflammatory, progressive, without antecedent trauma. Lab procedure: 11-blade attached to biopsy forceps, wrapped with tape to “guard” all but the tip. 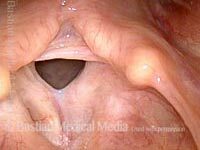 Vocal cords are re-adhering where the web was divided two weeks earlier. 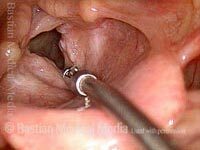 Biopsy forceps used to separate the adhesion. Slight bleeding at point of re-separation of the cords. Result (compare with photo 5). 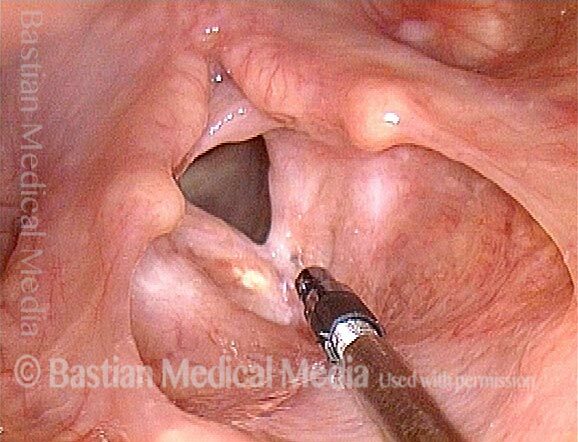 A depot form of steroid injection in the videoendoscopy laboratory (patient in chair). The intent is to abolish or diminish the inexorable re-adhesion of the vocal cords, sometimes many months after apparent complete healing and re-mucosalization. 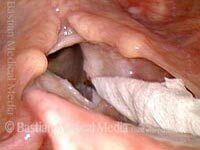 Note white submucosal material. Injection at apex of the web. 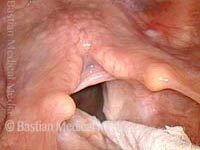 Note condensed white submucosal steroid, from prior injection. 16 months after last of a series of web divisions as depicted above. The web does not show any sign of re-forming. Compare with photos 1 and 2. Closer view, again showing maintenance of the deep V shape of the glottic aperture, rather than the short, fat U seen before web division. The patient has no shortness of breath.